The regional government of Andalucia said Tuesday said it is filing legal action and requesting a court injunction to halt natural gas production and storage in the Doñana wetlands natural reserve and adjacent areas in the Guadalquivir River estuary on the Atlantic coast of Andalucia. Andalucia’s environment minister, José Fiscal, said the regional government is taking the action over the national government’s refusal to subject the production and storage operations by energy giant Gas Natural Fenosa to joint inspection and evaluation with the regional government. A regional government spokesperson cited risk to the environment in the Doñana wetlands and surrounding areas posed by the potential impact of seismic activity on four separate Gas Natural production and storage facilities in the area. Andalucia has asked for a temporary injunction to halt the drilling and storage operations until a judge can issue a final ruling on its appeal. The Andalucian government announcement comes as the European Parliament prepares to send a fact-finding mission next week to make its own evaluation of the threats posed to the environment and wildlife habitat of the Doñana preserve by the Gas Natural operations. 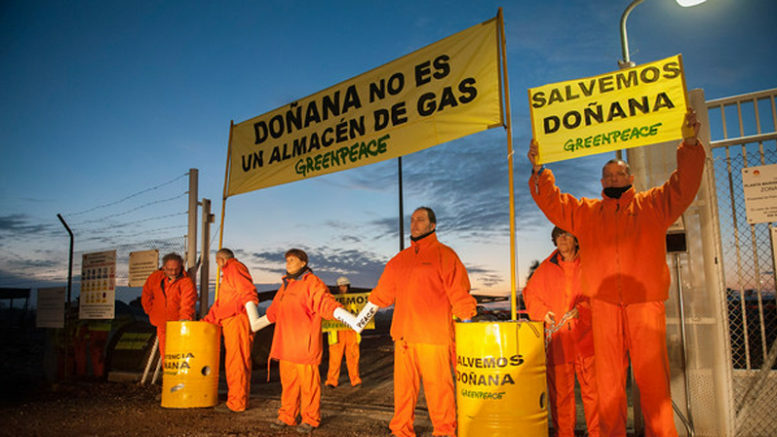 In November 2016, hundreds of local and national activists gathered near the nature preserve to protest the Gas Natural drilling and storage operations, following the occupation of the company’s facilities by activists of Greenpeace España. The protesters claimed the Gas Natural operations are inconsistent with sustainable development goals and pose a specific threat to the Doñana National Park, a 209-square-mile preserve and UNESCO-designated World Heritage Site.